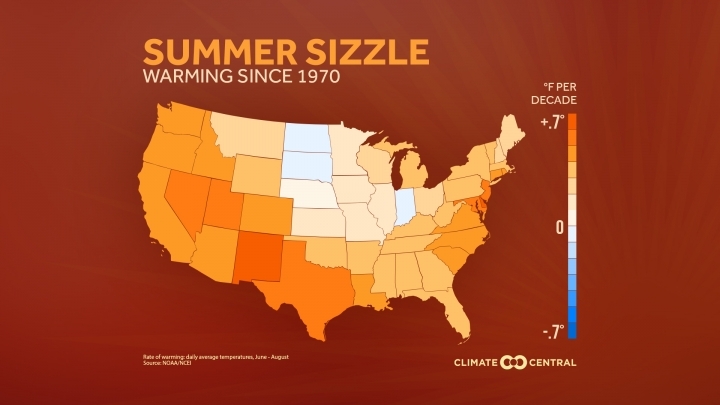 Climate Central's States at Risk project analyzed historic trends in summer temperatures since 1970 as well as projections for future extreme heat for hundreds of metro areas across the lower 48 states. Using several measures, Climate Central's findings show that most US cities have already experienced large increases in extreme summer heat and absolute humidity, which together can cause serious heat-related health problems. Click through to the site below to read Climate Central's analysis and explore their interactive maps.